My Boyfriend Hates Makeup: Splurge Versus Steal: Comparison of $3 Versus $14 Polish! Splurge Versus Steal: Comparison of $3 Versus $14 Polish! 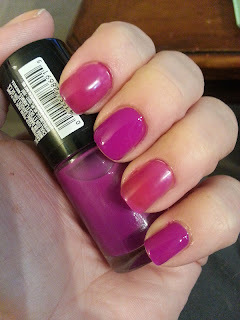 Ooh, this is NOT nearly as much of a dupe as my last comparison post! Anyway, I saw Illamasqua Stance and Maybelline's Forever Fuchsia near one another and thought they looked similar enough for a comparison post. Let me get right to the final results! This is three coats of Illamasqua Stance on my middle and pink fingers, and about SIX coats of Maybelline Forever Fuchsia on my ring and index fingers. As you can see, there is a pretty big difference already! Here is how it began! I used three coats of each and snapped an "in progress" pic. 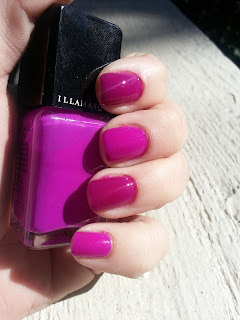 It is pretty clear that the Illamasqua on the pinky and middle fingers are much, much more highly pigmented and color-rich. In the sun, they looked closer in color. Stance pulls more to a pure blue purple, and Forever Fuchsia has a more mulberry, reddish tone to it. Both are pretty though! There are DEFINITELY differences in usability! F.Fuchsia is much lighter, streakier, and less pigmented. Stance covers the nail well in two coats, but I used three for the comparison "in progress" pics. 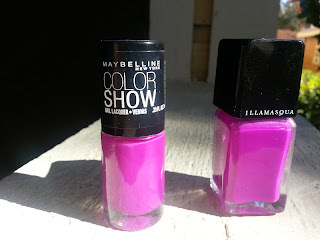 I have a couple other Maybellines and I believe the others perform better than this one. F.Fuchsia is pretty streaky. I am sorry to say, FF is NOT a dupe for Stance. Honestly, Stance is also the better buy! For $14, you get .5 oz of product and need just two coats per mani. Maybellines vary from $3-4 each, depending where you go, and was only .27 oz. Considering you need 4-5 coats to cover the nail, you'd run through this bottle in no time at all! If this is a color you truly love, I suggest splurging on Stance! You won't be sorry you did! Do you own any Illamasqua polishes? Which are your favorite? I love dupe posts. I like the Mayb shade better though. I'm picky about my pinks and fuchsias!